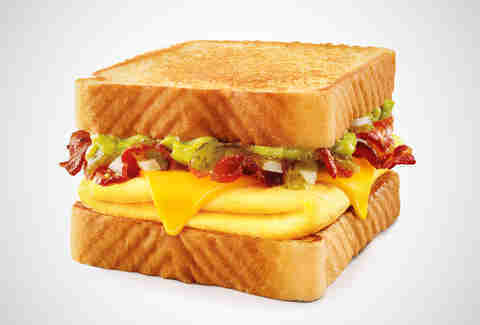 Since you now know that Mexicanized breakfast kicks the crap out of a sad bagel any morning, Sonic is making it even easier for you to get salsa on your eggs. For a limited time only, they'll be offering a Salsa Verde Breakfast Burrito AND Salsa Verde Breakfast Toaster sandwich to morning commuters hooked on the (green) sauce. Both the burrito and the Toaster'll house bacon, salsa verde, eggs, onion, and guac. But only the burrito comes stuffed with Sonic tater tots, as well as melted cheddar cheese instead of the Toaster's melted American. 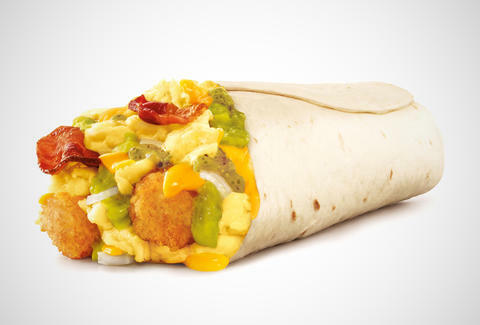 This marks the fifth breakfast burrito on the current Sonic menu, poising the drive-in for the super-niche crown of best fast-food breakfast burrito selection. On top of all that, Sonic is shilling large sodas, teas, and slushes for just 99 cents -- eat it, Macklemore's gator shoes -- anytime before 10a. Somewhere (probably not outside a Sonic), Michael Bloomberg is weeping into his small cup of water.